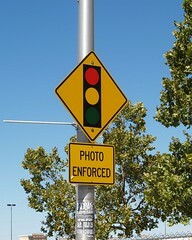 Red light cameras, speed vans and human patrols. All things that contribute to Albuquerque turning up as number 7 on the National Motorists Association (NMA) top 10 list for speed traps. I’m really not surprised to see Albuquerque on the list, and yet I still think I there’s never a cop around when you need one. In other words, the speed traps are probably needed. It also says something about my driving record as I’ve never had a speeding ticket in the 10 years I’ve lived here. Doesn’t mean I haven’t been lucky. I’ve been pulled over twice for not stopping at a stop sign. When I first moved here I had long hair and was driving around in the Maverick. I was pulled over by a cop that was two cars ahead of me for not wearing my seat belt. The Maverick only had lap belts and how could he see when he was two cars ahead of me? I never got a ticket for any of these incidences. I did have two speeding tickets when I lived in Arizona.